Futurama "Made By Hand and Tentacle" Launch :30 from Robert Sosin on Vimeo. When it was announced that Comedy central would be acquiring Futurama in 2005 and producing new episodes, I was over the moon (which probably has a slightly different connotation when talking about a show where they routinely travel to the moon, but whatever). I was a HUGE fan of the show, which I saw as a masterpiece of animation. The writing was so sharp, the characters were so rich, and the setting was so beautifully imagined... I couldn't wait to get something out that would convey my enthusiasm and passion about the show. From 2006 - 2013 I did every launch campaign for Futurama, and there was a bunch of them (befitting a show that died and was reborn so many times): the launch of old episodes (aired originally on Fox), the launch of the 4 movies (which they turned into a season of new episodes), the launch of brand new episodes in 2012, and the final season in 2013. I got to make a lot of amazing stuff for them, and got to work with some incredible people. My goal was to take the Comedy Central brand and position it so that it could celebrate the awesomeness of Futurama. This "Celebrate the Awesome" idea became a key part of the MAKE FUN spirit we built into our rebranding. The following spots were created in that spirit. For the return of new episodes of Futurama in 2012, we knew we wanted to do something big and bold. I wanted it to feel elaborate, and I had a realization that "elaborate" could be conveyed by showing "lots" of something: Lots of objects, lots of space, lots of time, or lots of effort. I thought that if we put in lots of effort into making something and made that effort visible, it would be an ideal vehicle to show our love and devotion to the show. For inspiration, I took some designers on a field trip to the birthplace of the term "FUTURAMA", the World's Fairgrounds in Queens. Within the Fairgrounds is the Queens Museum of Art, and in the Queens Museum of Art is the Panorama of the City of New York, a Robert Moses-commissioned giant scale replica of New York City. While viewing the panorama, I was struck by the idea that the open to Futurama, while being impossibly complex, was really only comprised of four main shots. If we could replicate those shots in our own studios with entirely handmade props, we could make something really special. Launch spot for the return of Futurama on Comedy Central in 2012. 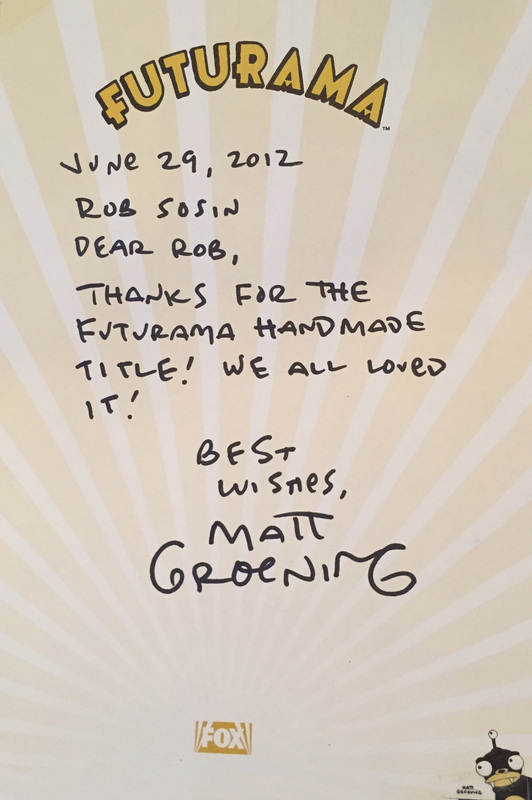 Show creators Matt Groening and David X. Cohen liked it so much they used it as the actual open to Futurama Episode 7ACV12 "Viva Mars Vegas" and wrote me a sweet handwritten note. The VO was read by the amazing Billy West, who also did several incredible answering machine messages for me. The video blew up virally pretty quickly, and was featured on Devour, Splitsider, and was the top hit on the "videos" subreddit for a while. Here's a time lapse series of photos showing DP Lane Savage and I constructing a set. This was featured as part of an exclusive on Vulture when they announced the new season was coming and showed the handmade open. Time Lapse footage of the construction of the final shot of the handmade Futurama open. That's me (Robert Sosin) and DP Lane Savage walking through the shots. The best thing to come out of it, though, was the news that executive producers Matt Groening and David X. Cohen loved the handmade open so much that they would use it in an actual episode. It's now the open to episode 7ACV12, "Viva Mars Vegas". Also, Matt Groening sent me (and the whole crew) a sweet handwritten note, because he is just the greatest. Besides the homemade open I made in 2012, I also made a clip-based campaign tapping into the Futurama-based memes happening at the time on sites like Reddit, 4Chan, 9Gag, and others. The difference being that since I had access to Billy West (voice of Fry, Zoidberg, and Dr. Farnsworth), I could actually get the memes voiced. We also reached out to the Futurama subreddit and asked if they had any particular Futurama memes they'd like to see read. They offered up some good ones, and surprised us by asking for things that weren't really memes but which they'd love to hear (like Professor Farnsworth reciting former senator Ted Stevens' "The internet is a series of tubes" speech). We recorded those as well and put them out on Reddit, delivering for our fans and engaging in an incredibly direct way. In the spring of 2013, I knew I was going to be making a promo campaign for the new season of Futurama, and I knew that in the course of making promos for that campaign I'd have the opportunity to do a VO record with Billy West (voice of Fry, Professor Farnsworth, Zapp Brannigan, and Dr. Zoidberg on Futurama) or John DiMaggio (voice of Bender on Futurama). you could only do it on an iPhone (at the time). No fancy cameras or computer effects (besides shooting a computer screen). There's no record button, you just hold your finger on the screen when you want to record and take it off when you want to cut. At the time, there was no capacity to edit. You had to get what you wanted the first take or start over. At the time there was also no capacity to send them up for review. You had to post one before you could make another. I considered my office an installation piece. But anyway. I put these three pieces of information together- Had potential John DiMaggio VO, had Rubber Bender, wanted to make Vines - and came up with a plan. I scripted out 30 6-second spots featuring Bender. I learned Vines work best if you think about them like comic strips. We made prototype versions of the scripts on an iPhone, using my voice for Bender. IMPORTANT: We did not post these, just saved them as files. They were pretty fun to make. We passed the scripts and prototypes by Futurama, and got them approved by show creator David X. Cohen and Executive Producer Lee Supercinski. We sent the scripts to John DiMaggio (voice of Bender) and got him to read his lines to picture. That was awesome. We hooked up speakers to the iPad and cued up John DiMaggio VO lines. Over the course of the month of July, we filmed 22 times, every time filming one spot and posting them. It's important when making Vines to have consistency, to keep building an audience. This was a TV spot pushing the Bender Vines I did for Comedy Central in the summer of 2013. This was about 3 months after Vine came out, so you couldn't edit vines and you could only record by holding your finger on the screen. They feature the voice of John DiMaggio (the actual voice of Bender). If you want to see more of these vines, you can check them out in my work retrospective. Or heck, for you? You can just click here if you want to take the shortcut.